We have a 30-day hassle-free return policy. If you are unsatisfied by your purchase for any reason, let us know via email to [email protected] within 30 days of your purchase confirmation email. Once we receive and confirm your return request, we will ask you to simply return the package to our warehouse. You will be charged a processing fee of 5% of the total amount of the order. Please note that the shipping costs are non-refundable. 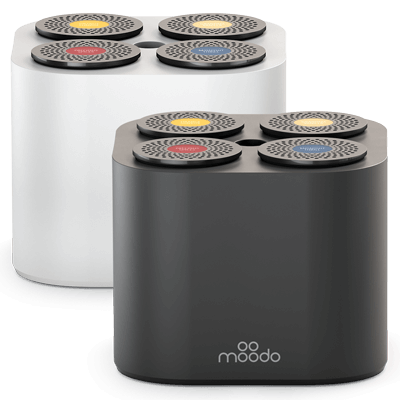 For example: If you purchase a Moodo device and scent capsules for $189 and pay US shipping costs of $7, should you decide to return the products within 30 days, you will receive a refund of $179.55 (after deducting the 5% return fee). In case the return is due to product defect, no cancellation or shipping fees shall apply. Orders usually ship within 24-48 hours from the order date, excluding weekends and holidays, unless otherwise specified. Shipping times will vary depending on the delivery location. If you would like to cancel your order, please contact us at [email protected] and provide your order number and full name. Provided your package has not been shipped by the time we receive your request, you will receive a full refund. If your package has already been shipped (or delivered), your cancellation will be treated as a return (see our Return Policy above). In case of return, we advise to pack the products in their original packaging. Make sure to include all original accessories. We will send you an email confirmation once we receive your return package. Your payment will be refunded after deducting relevant costs, if any (see above under Return Policy). We reserve the right to refuse any unauthorized returns, namely returns done without contacting us in advance as per our Policy.